Kancheepuram, a city famed for its multitude of Temples, is a microcosm of different styles of Dravidian Art and Architecture. Every dynasty that held sway over this sacred land seem to have competed with each other in building more elaborate and exquisite structures, the highlight being that they built new without destroying the older ones. Thus each Dynasty left its indelible mark in the form of architectural Splendors. In my Previous Post I had covered a Masterpiece of the Pallava King Rajasimha, Continuing the emphasis on Kancheepuram, I will be covering an exquisite piece of art gifted to us by the Vijayanagara Dynasty this Time. It is said that one should not judge a book by it cover and the same holds true for this structure.Sporting a very humble appearance from outside this structure holds a Treasure Chest in terms of Art and Architecture. 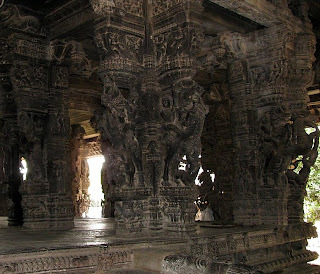 "Noor Kaal Mandapam" (Hundred Pillar Hall) in Sri Varadaraja Swami Temple is a lesson in architecture by itself. The ceiling of the hall is supported by some of the most exquisitely carved Pillars one can ever see. In Middle of the hall we have a raised Stage for the Gods to be Kept during Temple Festivals. These Pillars are the epitome of hard work and perfection. Surrounding these Huge pillars. The love of Horses has resulted in created a unique style of Vijayanagara architecture which is visible in Srirangam also.Mainly Consisting of Different scenes of Horsemen in various Poses from war, each sporting a unique headgear; This hall stands as a testimony to Vijayanagar Empire's Flourishing Trade with Outside World and their Advancement. Many Horses from Arab were brought by Vijayanagar Emperors and also many Arabs and Portuguese were recruited in the army. Same Diversity is reflected in these pillars also. We see in these pillars , people from different walks of life, be it a native, an Arabian or a Portuguese. 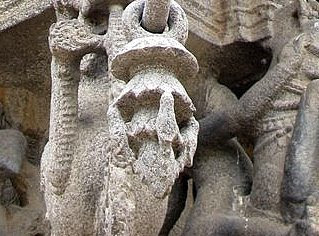 Also seen in the same complex are different facets of Vishnu's Avataar and scenes from day to day life. During my second trip to the temple, I was fortunate enough to see this work of art in detail. I would like to share some of the glimpses of the craftsmanship below for you all to enjoy. There are many "Easter Eggs" for visitors to find here... So one should be slow and steady when observing this work of art. (Mythical Creature) on the Outer Side of the Step Support. On the other side, a Small Beautifully Carved Krishna. Mesmerizing to see. What a contrast Big Outside and Small inside. A Lady getting ready for an Outing? As in all the Pillars here , The above is also sculpted out of Single Stone ! Notice the Attire Posture and Expression of the Horse ! Love is Blind, So is the Spectator ! I Hope that I have created enough Curiosity in all of you to visit the place with Lots of Time in hand. As you can see in many pictures, the sands of time have literally put a layer on these sculptures but when i visited the site there was a restoration process was in progress. Hope that this will bring out the original beauty of these Sculptures to the forefront. As always, request you to give your valuable feedback ! Note Of Thanks: I would like to thank my friend Vijay and Mr. Vinayagamurthy for making my visit a grand Success. About the Place: Being one of the Most revered Site esp. of Vaishnavite, the main shrine of temple is built on a small hillock known as Hastagiri. Adding to the sanctity of this temple is the Ancient and Original Idol of the Temple which is made up Atthi Maram (Fig Tree Wood). There is a unique custom associated with this idol; the Idol is safely stored in a silver Casket in the Temple Tank and Taken out only once in 40 years. The place was frequented by Vedanta Vaishnavite Guru Sri Ramanujan and his search for his eternal guru got fulfilled here. Nice ones on the roof top. had missed to feature. Very good article. Keep up the good work Swamiji. Good work swami!! Seems like an awesome place. Would love to go there in future! did go to kanchipuram recently, but yr post is sending me there again..
You articles is very impressive. The vijayanagara pillars massive in size, although of granite, are made to bend to the requirement of the sculptors. Hence variety could be explored in their creations. New experiments could be seen in their architectural activity, and pillar is one suce arena, where we find innovation and improvement . Good job exposing the details of sculptures that most people miss with a casual glance.